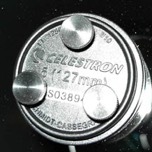 We offer knobs for the Celestron 5” Schmidt-Cassegrain secondary with either standard or metric collimation screws in the f/10 and rare f/6 versions. Select knobs for your telescope from the list below. Fits: Celestron 5” (13 cm) f/10 SCT (C5, NexStar 5) with black Allen, silver Allen, or silver Phillips factory collimation screws. These screws have standard threads. 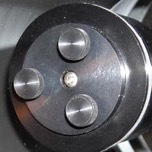 Will not fit scopes with black Phillips factory collimation screws (see Item B below). These knobs will fit all C5 models made prior to 2006, and all 2006 and later models EXCEPT those with black Phillips factory collimation screws. The black Phillips screw model requires C5 metric knobs (Item B beolw). Check that our screw threads match the factory screw threads before installing. Fits: Celestron 5” (13 cm) f/10 SCT (C5, NexStar 5SE, Omni 127) with black Phillips factory collimation screws. These screws have metric threads. Will not fit scopes with silver factory collimation screws (see Item A above). These knobs will fit only 2006 and later C5 models that have black Phillips factory collimation screws. 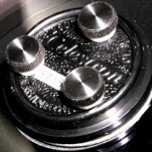 All C5 models made prior to 2006 and all post-2006 models with black Allen or silver factory collimation screws require C5 standard knobs (Item A above). Check that our screw threads match the factory screw threads before installing. Fits: Celestron 5” (13 cm) f/6 SCT only. Will not fit the Celestron 5” f/10 SCT. These knobs will fit only the rare C5 f/6 telescope. If your secondary looks like this, you have the f/6 version.